Even more interesting was two minutes later when the old, historic brick building in which I work began to shake and rumble, its bricks and windows creaking from the strain of infrequent and unexpected movement. For about 5 – 10 seconds, everything shook and thanks to the Tweets from Washington, I was instantly able to rule out a passing truck or explosion. It wasn’t a big deal and no one got hurt, which is good. It was one of those shared experiences that helps people flex their humor muscles and try to get a superswarm badge on Foursquare (no dice). Did you feel it? Did you know what it was right away? Where were you at the time? Naturally, I’m coming off as snarky because I’m disappointed in the pace of progress, which has mostly been hampered by protests and threatened litigation. Par for the course for any Buffalo development, really. I hope – truly hope – that the most recent plans that ECHDC has for Canal Side, involving interpretive canals, a public market space, and build-outs for other retail and food outlets will happen soon. We’re close to ten years out from the first announcement of Bass Pro. We’re now supposed to get excited over a shack that would look at home at any little league field. 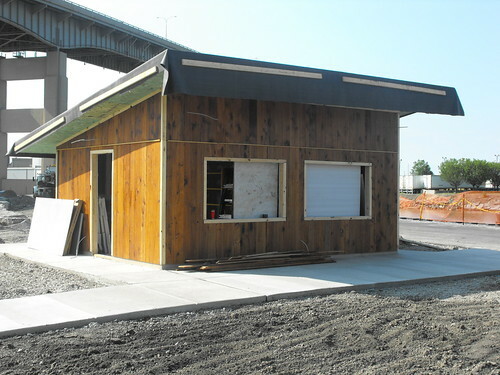 To make matters more bizarre, the ECHDC is so proud of this shack that it’s holding a naming contest for it. Not everything needs to be crowdsourced, guys. How about you bid out the food operation, and let the food operator choose the name? Fred Kent and his PPS were paid six figures of taxpayer money for their Google Image Search and unscientific “power of ten” feel-good hocus-pocus. I seriously want our money back. After all, we could have built a second shack with it. For some reason, the Twitter search function isn’t working quite right, so a lot of my favorites aren’t available. Suffice it to say many of them involved “Shack” or “Shed”. Disappointment breeds cynicism and sarcastic reaction – all three are growth industries in Buffalo.